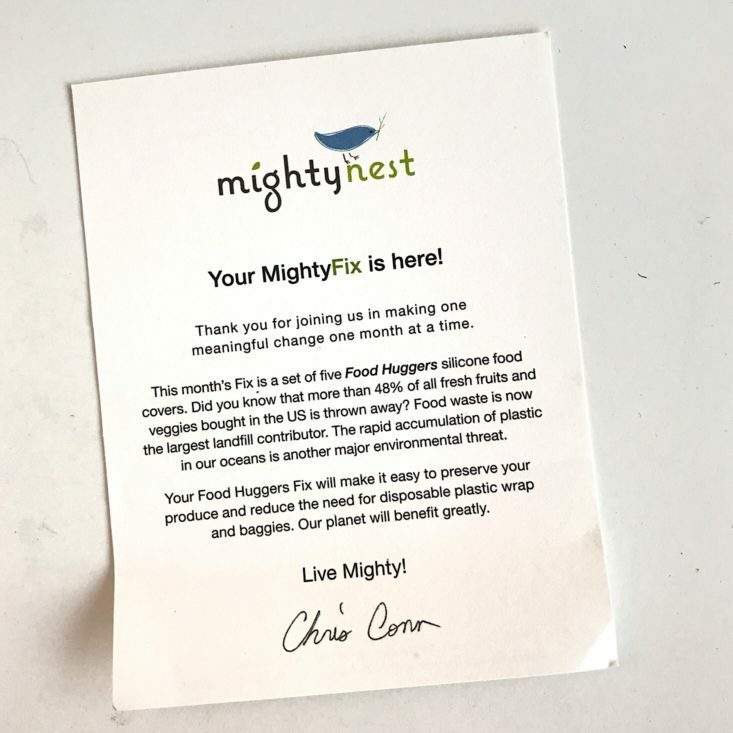 Mighty Fix is a subscription box from Mighty Nest. 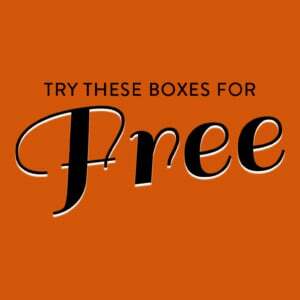 Each month they send you one new product to try, and you get free shipping on Mighty Nest as well. Or, use code FIX99FORAYEAR to get a yearly subscription for $99! Each box includes an info card telling you about the featured item and how what they chose to send you helps your house be “greener,” and you be “healthier”! This month’s featured item is a set of five Food Huggers. The back of the card has information on the product. I received a set of five reusable silicone food savers, in the colors fresh greens. The set of five huggers nest together to save storage space. The food huggers are ideal for my fruits and vegetables and there’s one mini hugger for bananas or limes to keep my food fresh. The food huggers can also reseal cans and opened jars. The food huggers are food safe silicone, 100% BPA and phthalate-free, and dishwasher safe with a lifetime guarantee. Food Huggers launched on Kickstarter in 2013 by two female friends. Here I place part of my apple face down into the food hugger and the silicone edges create a seal around my apple, keeping in moisture and freshness. Verdict: I’m amazed how Mighty Fix continues bringing items to my home that allows me to continue to live sustainably. This will halt the excess food waste that occurs when my fruit and veggies spoil by not sealing properly. Also, readers have mentioned in previous reviews that they already received a product I was reviewing, so keep that in mind when deciding to subscribe. Value Breakdown: The box cost $10 with free shipping, and I received a product valued at $12.95. Do not subscribe expecting to get fruit covers. I got 3 wool balls. Great for a family with 3 ppl allergic to wool. So. Not a fan. This review should make it clear you get whatever they send you not a specific january box. That is indicated in my review. I received a pack of 3 silicone can covers and I sometimes use them to cover avocado halves or fruit halves and they work great for that purpose too. I’m a new subscriber and I got wool dryer balls – I suspect that they sort of cycle through items for new subscribers. I’m gonna be That Person and tell you that you shouldn’t store food in metal cans – it’s less of a food poisoning risk than it was 40 years ago, but it’ll still give food that Can Flavor. Oooh, these look interesting! Better than a container. I received these last month and haven’t used them at all. Not sure how I feel about them. I’m interested to see how your apple survived the food hugger. Did it turn brown? Stay fresh and crisp? A follow up on how the product works would be appreciated! This is an item I would use! I quit the subscription after they sent several personal/beauty items like lotions and cream deodorants. This item seems to be more fitting of the subscription. Jules: There is a section in your profile where you can specifically opt out of receiving body and skincare. I chose to opt out and have never once received one. And this may be somewhat new so may not have existed when you subbed but under the “Your Account” section, you can now select your next month’s “fix” from a limited rotating selection of products. There is a section in your profile where you can specifically opt out of receiving body and skincare. I chose to opt out and have never once received one. And this may be somewhat new so may not have existed when you subbed but under the “Your Account” section, you can now select your next month’s “fix” from a limited rotating selection of products. They now have a second sub (also $10/Mo) that you can get that focuses on personal care products (lotion, sunscreen, etc,). Since they began offering that one I haven’t received any personal care items as my monthly fix. I’m super happy about that, because I love getting gadgets and the like for my fix. Click on the “My Account” icon, then select “My Account” from the drop down menu that appears. When the “Setup Your Profile” page appears, in the “Your MightyFix Preferences,” look for the “Body and Skin Care” section; select “No, please do not send these items,” then scroll down to the bottom of the page and click the “Save My Profile” button. I love my food huggers!